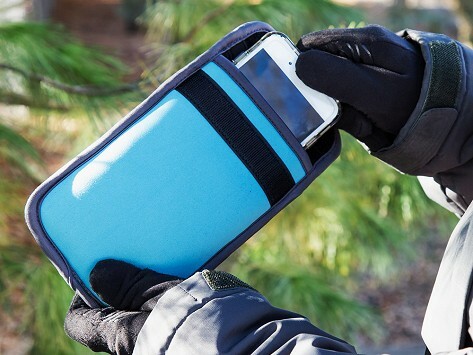 This insulated phone case keeps a smartphone the just-right temperature while you’re out in either chilly or steamy conditions. Eight layers of insulation are built into the case to protect a phone. Chill it in the refrigerator before hitting the beach or pop it in the microwave before heading out into the cold. If your phone is already overheated or frozen, no worries—the case can restore it in about a minute. Dimensions: 7.25" x 5" x 1.25"
This really works! Especially when temperatures are below 30 degrees. Can’t wait to try it with the heat this summer. ideal. purchased these for my son-in-laws. they are perfect for them in their jobs. ClimateCase Maker Lisa Lambert was vacationing in Arizona when the extreme heat zapped the life out of her family’s smartphones. She searched for a solution and came up empty-handed, so Lisa invented her own way to keep phones the just-right temperature in just about any condition. Her insulated phone case protects phones from overheating or becoming frozen thanks to eight layers of thermal insulation built inside. Pop the case (not the phone!) in the microwave before hitting snowy slopes or shoveling, or chill it out in the fridge for trips to the beach or pool on hot days. Forget to take these precautionary steps? No worries. A case can restore an already overheated or frozen phone in about a minute.